This game heralded the start of the Cisk League second round. In the corresponding first round clash, Overseas had won 36-19 so the interest at Marsa’s Pitch 1 was to see which team had developed their play to another level since then. Overseas were missing a few players due to injury as Kavallieri used their strong forward pack to keep their opponents on the back foot, not allowing them to win clean ball for their speedy backline. For the spectators it was all about waiting for the game to spark into life. Kavallieri drew first blood with a penalty, around the 30th-minute mark, from Joseph Cutajar. Overseas finally got some phases going with their forwards Harvey, Debono and Bordes crashing it up. Quick ball reached Briffa. He arced a kick over the Kavallieri backline and the fast-paced Mhaouch scored in the corner. The conversion was missed but Overseas led 5-3. Doublesin, again playing a lively game, got a fortuitous bounce off the head of an opponent and ran 60 metres to score, only to look back and see that touch judge Amanda Cassar had signalled that he had stepped out where it had all began. Overseas loose forwards Crawford, Corner and Murray were trying to get their team on the front foot, but they lacked cohesion and opportunities were lost. Kavallieri had made great improvements in their forwards, contesting the lineouts, big shoves in the scrum. Their backs were tackling well and getting the ball out to speedsters Imbroll, Fajak and Bartolo. The second half had Overseas with a slight breeze behind their backs so Briffa put some kicks in behind the Kavallieri defence for his wingers to run on to. In one such move, a head-high tackle brought a penalty try to Overseas and a yellow card to Brendan Dalton. Overseas extended their lead to 12-3 thanks to the conversion. With their tails up, Overseas attacked again and five minutes later, quick moves from their forwards saw the ball reaching Chris Borg who scored out wide – an unconverted try. Just when it seemed Overseas would run away with it, a series of forward drives from Kavallieri, with Nicholai Grech, Terence Galdes and Brenton Bonello prominent – provided the backline with fast ball and Dalton, who had just returned from his yellow card, scored out wide – 17-8. Then, a penalty from 40 metres out by substitute Darren Edmunds had Kavallieri within striking distance, now needing a converted try to win it. 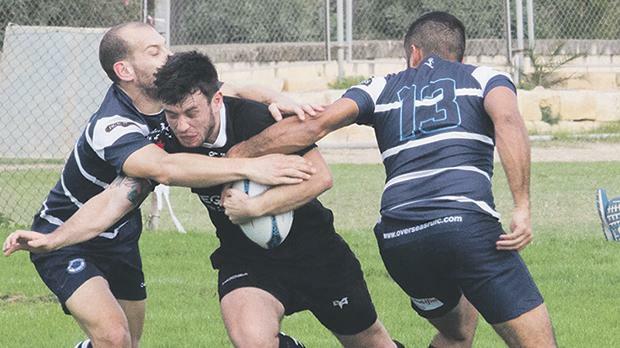 Murray was yellow carded for Overseas and with the extra man in the forwards, Kavallieri powered their way over from a ruck with Joseph Cutajar going the blindside to score in the corner – 17-16. Edmunds needed to kick the conversion to win it and he got two attempts at it as the Overseas players were shouting as he moved in to take the kick... which is not in the spirit of the game. But he missed the second shot as well and that was when referee Sam Ramage blew the whistle for full-time, Overseas winning it by the tightest of margins. Joseph Cutajar (Kavallieri) and George Corner (Overseas).